“New Evangelization: Passing on the Catholic Faith Today” by Cardinal Donald Wuerl. Our Sunday Visitor Publishing (Huntington, Ind., 2013). 96 pp., $4.95. “The New Evangelization and You: Be Not Afraid” by Greg Willits. Servant Books (Cincinnati, 2013) 160 pp., $16.99. “Jesus the Evangelist: A Gospel Guide to the New Evangelization” by Allan Wright. Franciscan Media (Cincinnati, 2013). 176 pp., $14.99. A triad of new books, including the cardinal’s, is for those “investors,” those who, through their dioceses, parishes or by way of personal commitment, are being trained to evangelize or who are already doing so. Basic resources for evangelization include the Bible, the documents of the Second Vatican Council and the Catechism of the Catholic Church. One might consider Cardinal Wuerl’s work another basic resource. One of 250 bishops from throughout the world to participate in the October 2012 synod on the new evangelization, Cardinal Wuerl provides an insider’s look at that event — a look that shares with nonattendees what the synod was, what it discussed and why its work is an important facet of the new evangelization. The cardinal has a knack for presenting what could appear to be daunting material in an easy-to-read, easy-to-grasp manner. This book provides practical guidance for those willing to carry out this aspect of their baptism, or who at least willing to learn how to carry it out. The chapter titled “Parishes — Centers for the New Evangelization” reminds parishes and their members how they can and are expected to evangelize. He quotes several synod propositions in making his case. Whereas Cardinal Wuerl’s message is primarily factual and instructional, Greg Willits’ “The New Evangelization and You” provides the instruction amid autobiography, anecdotes and witness from evangelizers, written in a “you-can-do-this” style. That last point is important, particularly as people in the pews take to heart the need for they themselves to be the evangelizers. To their response of, “I can’t do that,” Willits, director of evangelization and family life for the Archdiocese of Denver, can say, “Yes, you can!” and then demonstrate how. A radio talk show host and a blogger, his ability to speak to readers, i.e., potential evangelizers, is evident in how he defines the new evangelization: renewed spiritual devotion and catechesis, knowing Christ and understanding Christianity and Catholicism; and living the faith; and sharing it with others. A nice touch is that a prayer concludes each chapter, e.g., “A Prayer to Get to Know God Better,” “Prayer for Inspiration,” etc. Wright’s work is organized into six sections, the middle four titled for the witness of Matthew, Mark, Luke and John. Thus it is evident that Scripture is a foundation block in evangelization and in this particular work. As do Cardinal Wuerl and Willits, Wright, academic dean for evangelization in the Diocese of Paterson, N.J, includes questions at the end of each chapter — questions that require evangelizers and evangelizers-in-training to think about the mission on which they are embarking. In a chapter titled “Evangelizing People Where They Are,” he asks, “In your parish, how much time is allocated to reaching out to those who don’t know Christ? How much time is spent outside the parish going to meet lapsed Catholics and the unchurched?” In a nonthreatening style, Wright raises the questions that need to be asked as the new evangelization forms and undertakes its mission to invite people to know Christ. He is helping would-be evangelizers to be prepared for the battle. Those who use this volume as a text in their evangelization formation can expect to underline passages, circle sentences or add exclamation points to particular paragraphs. 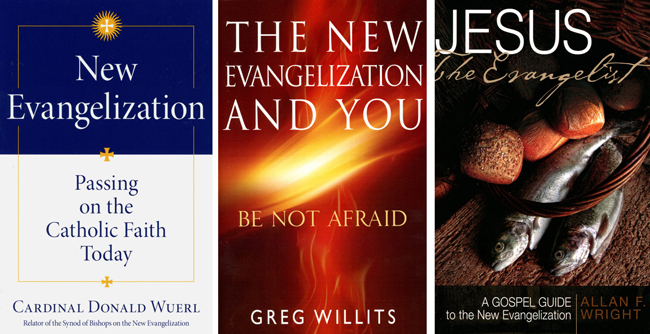 Each of these books addresses the new evangelization in its own way — from Cardinal’ Wuerl’s factual foundation to Willits’ witness approach to Wright’s emphasis on Scripture accompanied by soul-searching words. By itself, each is useful and a worthwhile addition to the resources those undertaking evangelizing will find helpful. Together, they reflect the vastness of the new evangelization and what it faces — Wright titles one chapter “Nicodemus: Evangelization and Confrontation” — and the potential for bringing people to Jesus. Also of interest: “Catholic Update Guide to the New Evangelization,” edited by Mary Carol Kendzia. Franciscan Media (Cincinnati, 2013). 54 pp., $5.99. Olszewski is general manger of the Catholic Herald, publication serving the Catholic community in southeastern Wisconsin.